This is day one of my photo challenge requested by my friend Don Bromberg. A bunch of photographers from all over the planet are participating and it will be easy for you to take part too. 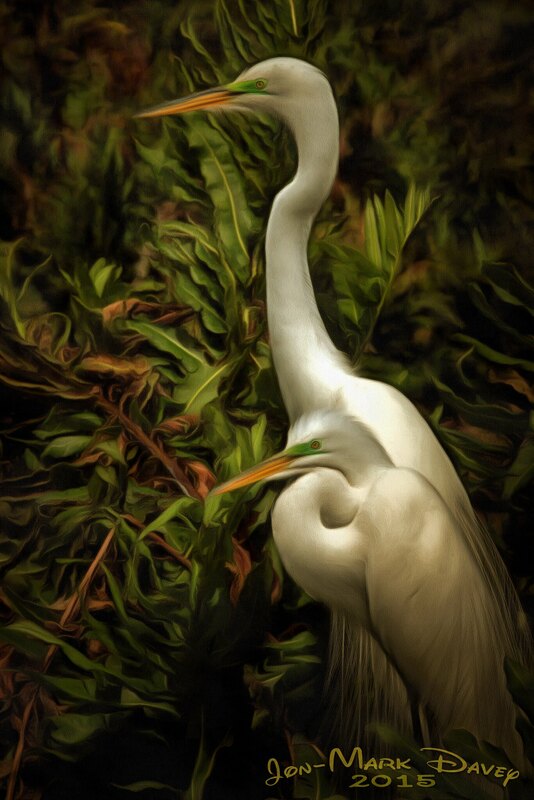 This is a vertical shot of a Great Egret mating pair. They are both in mating plumage and their face, along with the photograph, looks painted. This is a DAP process along with art touches created with ACDsee to set contrast and manage the RAW to jpg conversion. Nothing in the scene has been added or removed, just transformed to emulate a Renaissance style painting on canvas. This shot looks awesome on metal even though it has a canvas texture. I captured this shot in Wakodahatchee wetlands, Florida last season. These birds are so beautiful!